Very small, floating aquatic weeds that form large colonies and are often confused with duckweeds. There are several Wolffia species fount throughout the southeastern United States, all of which are typically found in lakes, ponds, streams, and rivers. The entire plants are usually about the size of a pinhead. The plants are green in color and elliptical in outline. No roots are found floating below. All though several Wolffia species occur throughout the southeastern United States, all can be distinguished from other aquatic weeds by their extremely small size and tendency to form dense colonies. 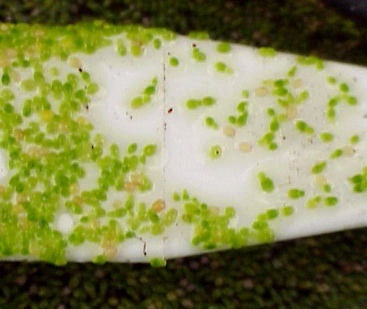 Some mistakenly identify these colonies from afar as a type of algae, however closer examination will reveal many individual plants that are very small and have no roots. 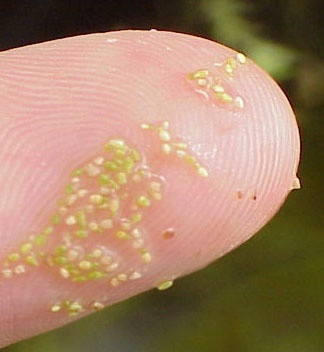 Watermeal is often misidentified as one of the Duckweeds (Lemna spp. ), however these weeds are much larger and have roots dangling below the water surface.